Colour has been used to highlight Creative gifts and to brighten our lives in many ways but is sometimes wrongly used to express Sinful actions or Negative emotions, as another example; to some blue means being depressed and green jealous and there are others but God said everything He made was very good and that includes Colours, He gave the world Colour in His awesome Creation and in His Rainbow of Promise after the World Wide Flood which was full of beautiful Colours. 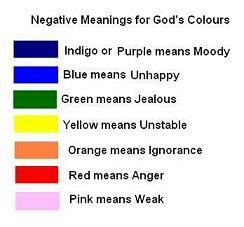 Below is some Negative examples of Colour found on the Internet and yes for sure best forgotten but there is also some Positive meanings below for Colours, you may be able to think of others, if so please share them and bless us all. I have also Posted a Power Point I created about Colour using a Popular Song at the bottom of this Post and a Link to one of my Poems about the Rainbow below which I hope you will enjoy too. Let’s take time to appreciate God’s Creation of Colour and the Beauty of the rest of His Creation that we see around us and to Thank Him for them and for His great Love for us. Thank you for sharing with me God’s Creation of Colour and His guidelines for Godly Living. This entry was posted in Kingdom Poem Reflections, Messages From The Heart, Power Point Presentations and tagged All good things come from God not bad, Bible, Blessings, Colours, God's awesome Creation, God's Love, God's Truth, Rainbow, Scriptures, The Colours of Love, The Creation of Colour. Bookmark the permalink. Amen-Amein Sister in Christ Jesus-Yeshua Anne!! God Bless you Sister in Christ Jesus-Yeshua Anne and Your Family members and Friends!! 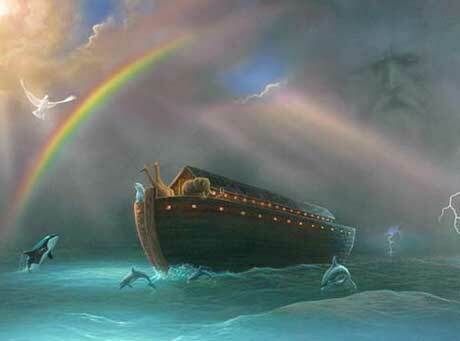 Our ONE True GOD the FATHER who art in Heaven Above CREATED the Rainbow as HIS Promise never to flood the EARTH again!! Thus, all the Rainbow colors belongs to our ONE TRUE GOD THE FATHER who art in Heaven Above and HIS SON Jesus-Yeshua, and HIS HOLY GHOST ( HOLY SPIRIT ), these THREE are ONE!! I Love you all Everyone through Jesus-Yeshua Christ, because HE LOVED 💕💜 EVERYONE FIRST!! I Love you too Kristi Ann in Christ Jesus and I’m sure many of our Christian Brothers and Sisters do too, you have a beautiful Heart focus. Yes the Rainbow as you shared Kristi Ann is God’s Promise not to destroy the earth again and each colour is as He said about all He Created, that they are very good and so are not to be used for evil purposes or to be even referred to as being evil. If we Created something good and people rubbished it I’m sure we would be upset. Here in the U.S., it is the fall season. The colors remind me of God’s faithfulness to bless us with beauty in every season! Fall brings out the reds, yellows and oranges. Winter dazzles us with white! Spring brings the color of the rainbow with spring flowers framed by shades of green. Summer brings us vivid colors of harvest! Thank you so much Debbie for sharing the Beauty of God’s Creation of Colours in the different Seasons and yes each Season shows how awesome they are just as all His Creation shows how Awesome He is with a Capital “A”. Christian Love Always my dear friend – Anne. God with a capital “G” and Awesome with a capital “A”! Yes!!!! Thank you Diane, God’s Color in His Creation is indeed beautiful and His variety is amazing. I will be in touch Diane, you have been in my Prayers, I’m so sorry for your loss, when our Loved ones are in our Heart were not really apart in Spirit but when they depart from us in this life, we still miss their presence, their arms, their smile and their voice. I was going to respond to your Post last night Diane and to my other Blogging friends too but I fell asleep at the Computer, I had been very busy during the day and it was very late but I will visit you soon. Thank you for your understanding Diane, I will Phone soon. God’s Comfort and Blessings – Anne. God’s Colours are a blend of His Love which brings inner Joy and Peace, His World of Colour shows His reality and He shines brighter than the Sun.